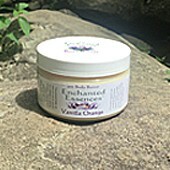 Chocolate Mint Body Butter: 4 oz. No chemicals, No Toxic Fragrances. No preservatives. Organic ingredients. Excellent for dry skin and for use in cold winter weather. Use sparingly. A Little goes a long way. Smells like a Dessert.... But don't Eat it.... It is food for your Skin! Handmade with Organic Raw Cocoa Butter, Organic Mango Butter, Organic Unrefined Cold-Pressed Jojoba Oil, Organic Camellia Seed Oil, Arrowroot Powder, Rosemary Antioxidant, Vitamin E, Pure Essential Oil of Organic Peppermint and Organic Botanical Flavors of Chocolate and Mint.... Yummy!! Melts like butter on the skin. Moisturizing with natural ingredients. Note on the Botanical Flavors that we use in our handmade Body Care products: We do NOT use so-called "Natural Flavors" (also known as "Natural Analogs") which are actually synthesized in a lab. The Botanical Flavors that we use in our handmade products are Genuine, Food-Grade Flavors which are used for culinary, scent and cosmetic applications. The Flavors are cold-processed using extraction without the use of any colorants, fillers, diluting agents or preservatives. (obtained through a proprietary technology conducted at temperatures below 118 degrees F. This process comprises a multi-stage extraction encompassing initial desiccation, lyophilization, CO2 and HFC extraction). The Botanical Name of the Flavor is the only Ingredient in it. They are wildcrafted or sustainably grown and non-GMO. They are safe for your skin and they Smell Delicious!! !